Joy Gryson has two new babies: her six-year-old daughter Olivia Harris and the budget handbag line which shares her firstborn's name. Little Olivia seems like the perfect namesake for the brand given her own keen fashion sense. "She's really, really funny. Whenever we see someone walking in the street with one of the bags, she gets too excited," explained the New York designer. "She loves the little charm and the tag." Showing you're never too young to carry a designer purse, Olivia enjoys carrying a one-of-a-kind creation made lovingly by her mother. Her pink leopard cross-body hobo covered in hammered rivets doesn't sound like the most tasteful creation around, but that just makes it perfect for a mini fashionista. While Olivia would love to take it to her first-grade class, her mother insists it's for weekend use only. While fashion fans can't get Olivia's beloved bag, others like it are available in the Olivia Harris collection. "We're all about downtown," explained Joy Gryson. "If the Gryson girl is TriBeCa, the Olivia Harris girl is her younger, cooler, rock ’n’ roll baby sister from Brooklyn or the LES." 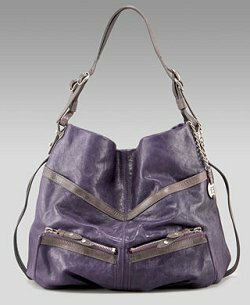 The Olivia Harris handbags start from $155, and range up to $495. You can find them at Bergdorf Goodman, Bloomingdale's and Saks Fifth Avenue.